Above: Water distribution in Baku after the Shollar Water works were installed. Photo after 1917. The people of Baku suffered greatly because the city lacked a good water supply. In the 1880s, city management started dealing seriously with this issue. But oil baron Haji Zeynalabdin Taghiyev was the most active in pursuing exploration and construction activities to solve this problem. At first, the officials tried to find a source of water inside the city of Baku, then in Shamakhi, but without success. In 1892-1893 a new project was proposed - the construction of a water pipeline from the Kur River [which runs from the northwest to the southeast through the country]. However, the plan was rejected because it was thought to be too expensive. In the end, the city management decided to build a desalination plant to process water from the Caspian. But the plant could only handle approximately 30,000 buckets a day - not enough for the city's population. Moreover, the water had a reddish-brown color and a bad smell and taste. So the people preferred to use water from wells, which wasn't good at all. Studies indicated that out of the 800 wells in the city, only 100 were good enough to use. In 1892 a cholera epidemic broke out. In 1898, the city purchased more desalination equipment. In the meantime, merchants sold water that had been taken from the Kur and Volga rivers. A bucket of Kur water cost 0.5 kopek, and Volga water - two kopeks. The poor people who couldn't afford to buy water had to use the bad water from the wells. As a result, infectious diseases often broke out. The city administration regularly carried out disinfectant programs; sometimes it just closed the bad wells. 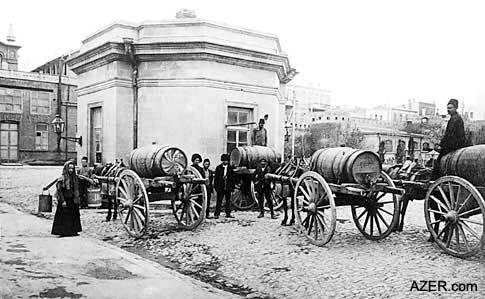 In 1899 Taghiyev signed an agreement with a foreign company for 25,000 rubles and invited British engineer William Lindley, who had considerable engineering experience constructing water pipelines in European cities, to come to Baku to help the city solve its water problem. This time, Taghiyev informed the city officials, a pipeline would be constructed. It didn't matter if the money came from the city treasury or his own wallet. In the end Lindley found water - Shollar water - near Guba, 190 km north of Baku. According to Lindley's calculations, this source was enough to provide water for the entire city. However, the city's management was skeptical and wanted to table Lindley's project. Taghiyev didn't let it happen. He kept insisting, "Just as Shahdagh [the highest mountain peak in Azerbaijan] will exist forever with its snow and ice, so will Shollar water. As for me, I won't begrudge the money or the effort. I'll do my best to provide my native city with water, even if I have to spend my entire fortune." Not long thereafter, an official from Baku went to Paris and stayed at the Louvre Hotel. Having learned that Taghiyev was staying at the same hotel, he went to visit him. With the help of a translator, Taghiyev was conducting a lively discussion with a Parisian official - namely, the mayor of Paris. Taghiyev mentioned that he was going to see the water system of Paris. "You're welcome to join us if you want," he told the Baku official. That day they traveled all over Paris. Taghiyev worked tirelessly. He kept bombarding the French specialists with questions: "What's this? What's that device used for?" The Baku official got very tired, but Taghiyev went on exploring and inquiring, as if the very goal - the meaning of his life - were to construct a water pipeline. In 1903, a private company built a water pipeline from Zaghulba. The company that supplied water from Kur also expanded its activity. The Nobel and Zubalov brothers built a modern water desalination plant. Those who were already supplying Baku with water - individuals as well as trade societies like Caspian, Caspian-Black Sea and Arzamas - tried to block Taghiyev's pipeline construction because they knew it would mean a loss of their own income. But the city management, under Rayevsky's leadership, sided with Taghiyev. Construction on the pipeline moved very slowly. To speed up the process, Taghiyev and Rayevsky sent lawyer Mammad Hassani to St. Petersburg to ask the state government for a 5 percent loan. At the end of 1909, Russia's Council of Ministers issued a 27-million-ruble loan with 5 percent interest. The project was confirmed, and by 1911, the construction had begun again at a renewed pace. According to calculations, the pipeline would convey 3 million buckets a day. Other oil industrialists, following Taghiyev's example, invested in the project as well. Taghiyev himself used to visit the construction site nearly every day and present workers with gifts and money. Construction of the pipeline was completed in late 1916. Special booths with domes were built on all of the streets, with a special guard at each one to control the water distribution. These booths were called "fountains". Special water coupons were issued. The grand opening ceremony for Shollar took place on February 18, 1917. People swarmed into the streets to celebrate this event. With a Koran in his hands, Mir Mahammad Karim delivered a speech about the importance of water for the sustenance of human life. He expressed his gratitude to all who had participated in this undertaking, especially emphasizing the great contribution that Taghiyev had made to the project. Taghiyev himself was given the honor of turning on the water faucet for the first time. He, in turn, shared this privilege with Aghajava, an elderly blacksmith who had worked hard to help construct the pipeline. It's impossible to convey how ecstatic everybody was that day. Sheep were sacrificed; so were oxen and camels. Feasts were organized, and food and clothing were distributed to the poor. The water was made available three times a day - morning, afternoon and evening. On this occasion, Taghiyev and the city management received so many congratulatory telegrams. Rayevsky, the former head of the city, wrote from St. Petersburg that Taghiyev's quarter-century-long efforts had not been in vain, and he congratulated him on this truly important event for the city of Baku. From Manaf Suleymanov's book, "What I Heard, What I Read, What I Saw," published in 1990 by Azerbaijan Publishing House and translated here by AI staff member Arzu Aghayeva.